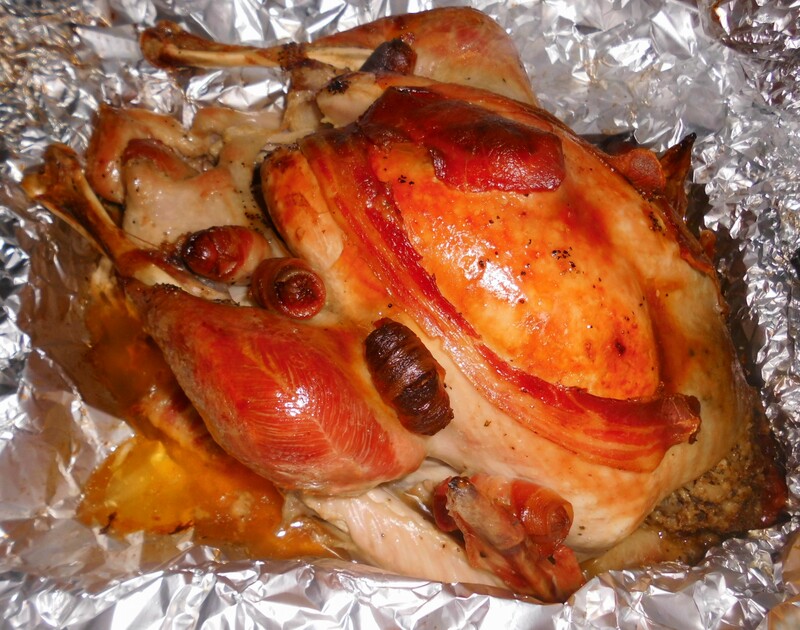 …a terrifically simple recipe for roast turkey for the coming New Year’s Eve celebrations! Dawn: And there’s five rings of truth in that statement…get it, Andrew? Andrew: Indeedy, I do! So what are we doing this year with the turkey, Dawn? First, remove any packaging that the turkey may be wrapped in. Dawn: This seems obvious but there’s a reason to highlight this. Do not wash the turkey but instead, turn it upside down on a large piece of baking foil. 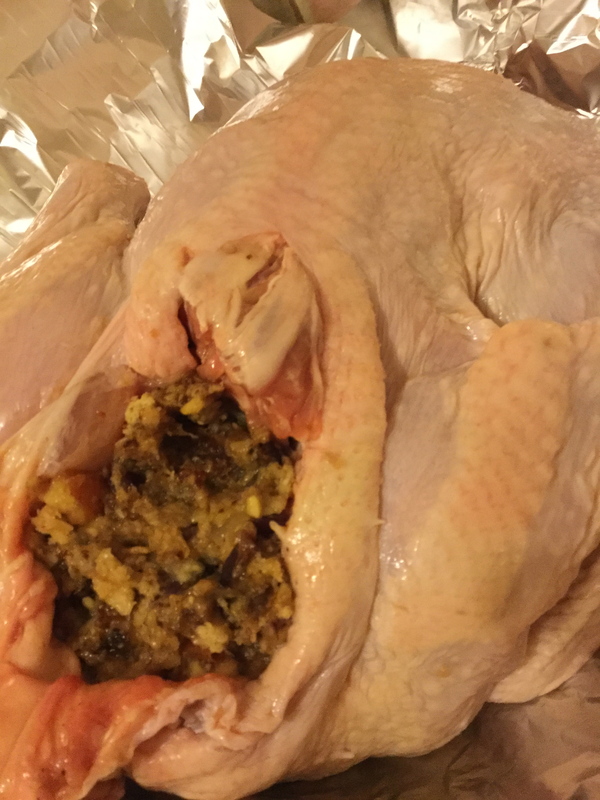 Preheat the oven gas mark 6/200º C.
Next, take some of your prepared stuffing and place in the neck cavity of the turkey being mindful not to cram it too much that there’s no space for it to breath. Once the stuffing is inside the turkey, turn the turkey the other way up so that the breasts side is facing you. 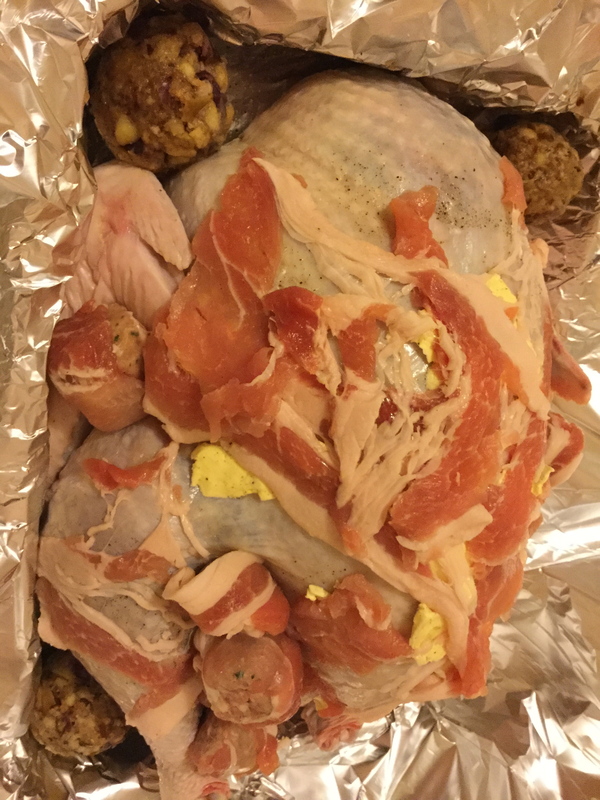 Carefully lift the turkey in the foil and place in a large enough baking tin leaving the foil draped either side. Taking the knob of butter, spread this across the breast side of the turkey. On top of the butter, carefully place strips of the bacon making sure the majority of the turkey’s flesh is covered. Andrew: The butter and bacon ensures the turkey meat doesn’t become dry in the long cooking process. Dawn: Yes, they do and with any leftover stuffing mix, simply divide the mixture equally and form into balls. Place in the baking tin alongside the turkey. With the baking foil that’s draped either side of the baking tin, gather the foil to create a small tent-like construction so that air can circulate in the cooking process. Place in oven and allow to cook for 30 minutes. After 30 minutes, reduce the heat to gas mark 3/160º C and roast until cooked. Andrew: Remember to keep basting the turkey throughout the roasting time. For each 1lb/500g the turkey weighs, add 15-20 minutes to the cooking time. If the juices are not clear, return the turkey to the oven. For the last 15-20 minutes of roasting, remove the foil to crisp the skin. Dawn: The turkey was introduced into Britain in the 16th century but it was the Victorian period that roast turkey really became so popular as a main Christmas Day course. Andrew: Yes, that’s true, Dawn and another popular method at the time to retain the meat’s moisture through the cooking process was to use butter and honey, melted and then poured over the turkey creating a honey-roasted turkey for dinner. Dawn: Delicious! And speaking of delicious, I have a Cook’s Cheat Idea here for pigs in blankets. Buy your favourite sausages and streaky bacon. The day before, simply take each individual sausage and wrap with the streaky bacon. Then simply chop up to the required length and add to the turkey just before you pop it in the oven.